With growing concern over global climate change and the US Federal government frozen in political gridlock a number of U.S. cities have decided to unilaterally take action to reduce their own green house gas (GHG) emission. Any serious effort to reduce GHG emission must involve the implementation of some kind of system to track energy consumption. To this end these same cities have instituted Energy Benchmarking laws — laws that require building owners to annually submit energy consumption data (by fuel) to a designated agency that collects and processes these data. The Institute for Market Transformation (IMT) has been instrumental in coordinating this effort. The requirement is typically phased in over a couple of years — starting with municipal buildings, followed by large commercial buildings, smaller commercial buildings, and finally residential buildings. New York City, Philadelphia, Washington DC, San Francisco, Austin, and Seattle were the first to pass such ordinances. Minneapolis, Chicago, and Boston have all taken steps to follow suit. Public disclosure of energy data is an important component of many (but not all) of these local ordinances. New York City (NYC) is further along than other cities and last October released 2011 energy benchmarking data for commercial buildings that were 50,000 sf or larger — excluding condominiums. Public benchmarking data were released for more than 4,000 large commercial buildings in the NYC’s five boroughs. NYC, like many of the other cities engaged in benchmarking, utilized the EPA’s ENERGY STAR Portfolio Manager for gathering and processing benchmarking data. Data released included building address, building type, total gsf, site energy intensity, weather-normalized source energy intensity, water usage, and total GHG emission. The NYC benchmarking data included data for more than 1,000 office buildings. Some of these buildings are certified green buildings, so would be expected to use less energy and have less GHG emission than other NYC office buildings. These green buildings are not identified in the NYC Benchmarking data, but many may be identified by searching other data bases – such as the US Green Building Council’s LEED project database or the EPA’s list of ENERGY STAR certified buildings. A few dozen LEED-certified office buildings have been identified in the 2011 NYC Benchmarking database. (The full peer-reviewed paper is to be published in Energy and Buildings.) Of these, 21 were certified before 2011 by new construction (NC), existing buildings operation and maintenance (EB:O&M), or core and shell (CS) LEED programs which address whole building energy use. These 21 buildings constitute 21.6 million gsf. 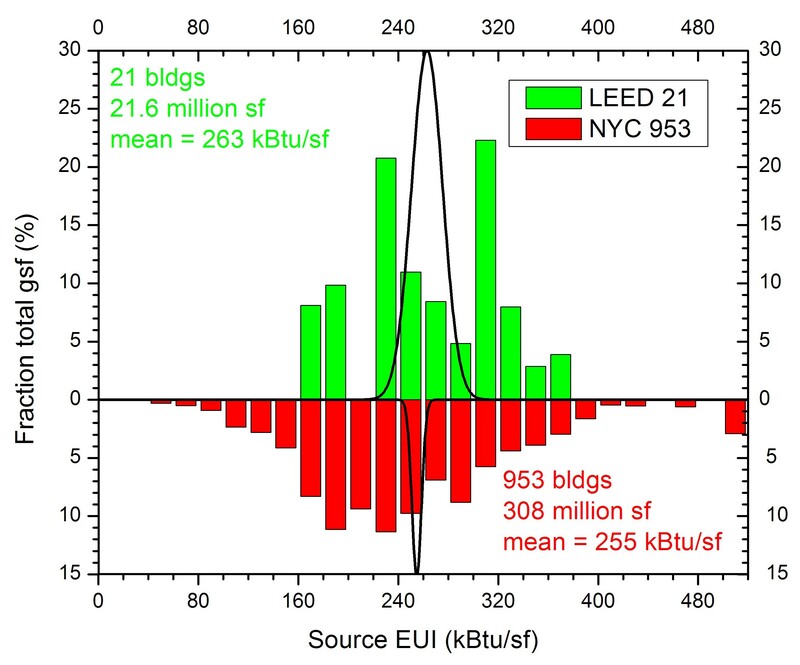 Their 2011 source energy consumption and GHG emission has been compared with those for the other NYC office buildings with rather surprising results. The LEED-certified office buildings, collectively are responsible for 3% more source energy consumption and GHG emission than other large NYC office buildings (adjusted for total gsf, of course). The graph below compares source energy intensity histograms for the two building sets. The graph shows that the difference in the mean source energy intensities of the two building sets is not statistically meaningful. In other words, the source energy consumption and green house emission of these LEED-certified office buildings is no different from that of other NYC office buildings — no more and no less. As of a few months ago there were something like 8,300 buildings certified under one of the LEED programs that claim to reduce whole building energy use. Measured energy consumption data have been published for 3% of these (now about 250). While many of these LEED buildings surely save energy, many do not. Collectively the evidence suggests, that LEED certification does not produce any significant reduction in primary energy use or GHG emission. Why then does the Federal Government — and other governments (including NYC) — require new government buildings to be LEED certified? The Federal Drug Administration (FDA) would never certify a medical drug with so little scientific evidence offered — let alone require its use. The standards here are inverted — apparently the Federal Government believes convincing scientific data must be offered to demonstrate that LEED-certified buildings do not save energy before they will change their policy. This entry was posted in benchmarking, building energy, Energy Star, LEED Buildings and tagged energy benchmarking, Energy Star, Leadership in Energy and Environmental Design, LEED, US Green Building Council by The Pragmatic Steward. Bookmark the permalink.